This data set contains measurements of atmospheric carbon dioxide (CO2), methane (CH4), carbon monoxide (CO), hydrogen (H2), nitrous oxide (N2O), and sulfur hexafluoride (SF6) collected from December 2000-November 2005 as vertical profiles above three sites in Brazil: Fortaleza, Santarem, and Manaus. At Santarem, ascending profiles were made above the Tapajos National Forest, near the km 67 Tower Site. At Manaus, ascending profiles were made above the K34 flux tower (aka, ZF2 km 34 tower) to the northwest of the city of Manaus. Descending profiles were flown nearby, but at locations upwind of population centers to avoid possible pollution. Fortaleza samples were collected off the coast, over the Atlantic Ocean to sample background air before it flows over the Amazon Basin. Air samples were collected as discrete samples aboard light aircraft and shipped to laboratories for analysis relative to internationally accepted calibration standards. There are three comma-delimited (.csv) data files with this data set. Figure 1. Map of sites sampled in this study. 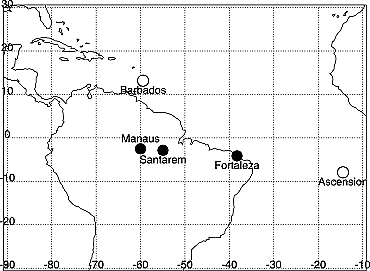 Open circles are marine boundary layer (MBL) background sites and filled circles are vertical profile sites within Brazil (Miller et al., 2007). This data set was archived in July 2013. Users who download the data between July 2013 and June 2018 must comply with the LBA Data and Publication Policy. The investigators were Miller, John Bharat; Tans, Pieter P.; Artaxo, Paulo; Gatti, Luciana Vanni; Martinelli, Luiz Antonio; Crotwell, Andrew Michael; Guenther, Doug; Moreira, Marcelo Zacharias; Polakiewicz, Lilian; Procopio, Aline Sarmento; Rizzo, Luciana Varanda; Siqueira D'Amelio, Monica Tais and Thoning, Kirk. You may contact Miller, John (john.b.miller@noaa.gov). This data set contains measurements of atmospheric carbon dioxide (CO2), methane (CH4), carbon monoxide (CO), hydrogen (H2), nitrous oxide (N2O), and sulfur hexafluoride (SF6) collected from December 2000-November 2005 as vertical profiles above three sites in Brazil: Fortaleza, Santarem, and Manaus. Air samples were collected as discrete samples aboard light aircraft and shipped to laboratories for analysis relative to internationally accepted calibration standards. There are three comma-delimited (.csv) files of atmospheric chemistry data with this data set. When expanded each file contains a (.csv) data file for that site. Data were collected over three primary sites: Fortaleza, Santarem, and Manaus, Brazil. Spatial Resolution: Spatial resolution of the air sampling is a function of the groundspeed of the aircraft and the time taken to fill a sampling flask. Given a groundspeed of 200 km/hr, and a 30 second sampling time, we estimate that the air sample integrates over about 2 km, which projects onto a portion of a typical profile sampling circumference of about 10 km. where site= 'san' (santarem), 'ftl' (fortaleza), or 'man' (manaus). Table 1. Variables for the 3 .csv data files. The variables are dry air mole fractions of the following gases: CO2, CH4, CO, H2, N2O, SF6 and the 13C/12C ratio of CO2 (and the 18O/16O ratio of CO2, which is not valid due to moisture contamination in sampling). Isotopic ratios are only available on samples obtained prior to 2004.
indicate the results of the data selection process. samples with obvious problems during sample collection or analysis. column indicates samples which are believed to be non-background. is a sample qualifier that is not presently used. A.. this flag indicates that there was a problem with the sample collection or analysis. 18 CH4_mix_ratio ppb CH4 mixing ratio in ppb (nanomole CH4/mole dry air (ppb)). A three-character flag follows the value. 20 CO_mix_ratio ppb CO mixing ratio in ppb (nanomole CO/mole dry air (ppb)). A three-character flag follows the value. 22 H2_mix_ratio ppb H2 mixing ratio in ppb (nanomole H2/mole dry air (ppb). A three-character flag follows the value. 24 N2O_mix_ratio ppb N2O mixing ratio in ppb (nanomole N2O/mole dry air (ppb)). A three-character flag follows the value. 26 SF6_mix_ratio ppt SF6 mixing ratio in ppt picomole SF6/mole dry air (ppt)). A three-character flag follows the value. 28 d13C_CO2_isotope_ratio per mil d13C (CO2) isotope ratio in per mil (per mil relative to V-PDB). A three-character flag follows the value. 30 d18O_CO2_isotope_ratio per mil d18O (CO2) isotope ratio in per mil. A three-character flag follows the value. D18O CO2 DATA ARE NOT RELIABLE DUE TO HUMIDITY CONTAMINATION. WARNING: YOU MUST PAY ATTENTION TO THE FLAG VARIABLES IN THE DATA SET AS WE INCLUDE **ALL** DATA, EVEN THOSE WITH KNOWN ERRORS. Typical Application of Data: The data are most useful for the evaluation and estimation of surface trace gas fluxes. See Miller et al., 2007, for an example. Theory of Measurements: The theory of the measurements is based on standard optical absorption (CO2), gas chromatographic (CH4, CO, H2, N2O, SF6) and isotope mass spectrometric techniques (d13CO2). However, the most important aspect of these measurements is the attention paid to careful calibration relative to World Meteorological Organization (WMO) standards. Data Usage Guidance: Users should keep in mind issues of representativeness of aircraft trace gas measurements. In general, data closer to the ground has a small footprint. But, the extent of the 'footprint' of these measurements is an open research question. That said, we feel that these measurements are influenced by 'regional' as opposed to 'local' sources, which we define for the time-being as: regional ~ 10^5 - 10^6 km^2; local ~ 10^2 - 10^3 km ^2. Mole fraction measurements were made relative to NOAA scales, which in most cases are the sanctioned WMO scale for the trace gas. Known Problems with the Data: Problematic data are identified with flags in the data files. WARNING: YOU MUST PAY ATTENTION TO THE FLAG VARIABLES IN THE DATA SET AS **ALL DATA WERE INCLUDED**, EVEN THOSE WITH KNOWN ERRORS. When samples were measured in the lab, tanks of air, treated as unknowns were also measured. The long-term stability of these unknowns and the lack of bias relative to their independently known values suggests that the accuracy of our measurements is of the same order as the measurement precisions listed above. Air samples were collected during regular (weekly) flights over the Santarem area and over the Atlantic Ocean off the coast near Fortaleza using small charter aircraft. Air was collected with portable sampling systems consisting of separate compressor and flask units (NOAA programmable flask package). These units are loaded onto a light aircraft, and the pilot initiated sample collection at predetermined altitudes. Most flights consisted of one descending and one ascending profile from 3,600 m to 300 m.
From 2000 to 2003, samples collected in Brazil were sent to the NOAA lab in Boulder, USA, where they were analyzed for CO2, CH4, CO, N2O, SF6, and H2 and the stable isotopes of C and O in CO2. From 2004 to 2005, a replica of the NOAA analysis system began operating in Brazil at Instituto de Pesquisas Energe´ticas e Nucleares (IPEN), with precision and accuracy similar to that at NOAA. At Santarem, ascending profiles were made above the Tapajos National Forest, near the km 67 tower that is located about 10 km to the east of the Tapajos River. For the first 4 years, descending profiles were made 30 km to the east of the tower to evaluate possible impacts of fluxes from the river (Richey et al., 2002). At Manaus, ascending profiles were made above the K34 tower (aka, ZF2 km 34 tower) to the northwest of the city of Manaus (population 1.8 million), following descending profiles 50 km to the northeast of Manaus, in order to avoid possible pollution from Manaus at the K34 tower, which can be downwind of the city. The samples were collected in 17 glass flasks using automated equipment, and shipped to the laboratory in Boulder or IPEN for analysis for CO2, CO, CH4, H2, N2O, SF6 and the stable isotopes of C and O in CO2. The companion file (TG06_Vertical_Profiles_readme.txt) provides a summary of the site, coordinates, predefined sampling altitudes, and notes for sample collections. Miller, J. B., L. V. Gatti, M. T. S. D'Amelio, A. Crotwell, E. Dlugokencky, P. S. Bakwin, P. Artaxo, and P. Tans. 2007. Airborne sampling reveals large methane enhancement over the Amazon basin, Geophys. Res. Lett., 34 (L10809, doi:10.1029/2006GL029213.). Meirink, J. F., P. Bergamaschi, C. Frankenberg, M. T. S. D'Amelio, E. Dlugokencky, L. Gatti, S. Houweling, J. B. Miller, T. Rockmann, M. G. Villani, and M. Krol (2008), Four-dimensional Variational Data Assimilation for Inverse Modelling of Atmospheric Methane Emissions: Analysis of SCIAMACHY Observations Journal Geophsy. Res., In Press.